R packages for interacting with the National Center for Biotechnology Information (NCBI) have, to-date, depended on API query calls via NCBI’s Entrez. For computational analyses that require the automated look-up of reams of biological sequence data, piecemeal querying via bandwith-limited requests is evidently not ideal. These queries are not only slow, but they depend on network connections and the remote server’s consistent behaviour. Additionally, users who make very large requests over extended periods of time run the risk of being blocked. 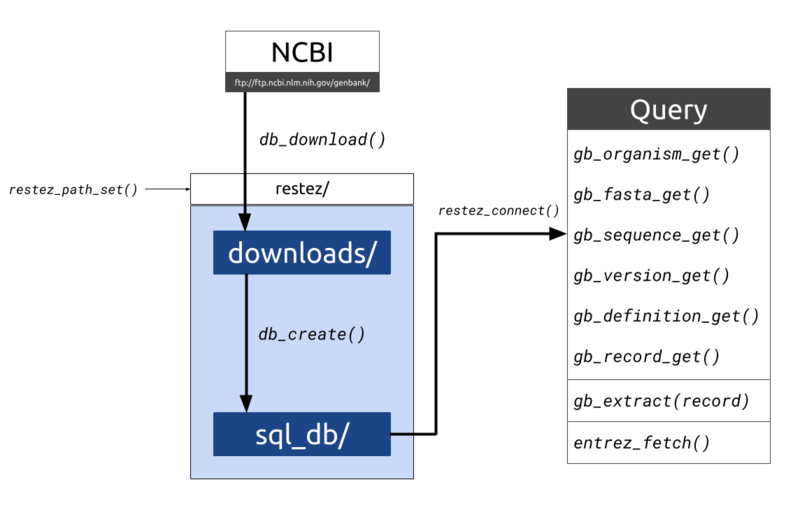 restez attempts to make large queries to NCBI GenBank more efficient by allowing users to download whole sections of GenBank, create a local database from these downloaded files and then query this mini-GenBank version instead. This process is far more efficient as the downloaded files are compressed and users can limit the size of the database by only creating it from sequences of interest (limiting by taxonomic domain and/or sequence size). For more a detailed description and for tutorials of the package, please visit the restez website. Figure 1. Diagrammatic outline of the restez functions and folder structure. Data is downloaded from NCBI into a file path set by the user. Raw downloads are stored in “downloads/” the generated database is stored in “sql_db/“. This database can then be queried with a series of gb_*_get() functions as well as some additional wrappers. restez (v1.0.0) is available from CRAN. Alternatively, the latest development version can be downloaded from restez’s GitHub page. To walk us through the basics of restez let’s pretend we’re a microbiologist interested in the sequence diversity among all the bacteriophages that infect Escherichia bacteria. First, we will first need to create our sequence database. Second, we will need to identify the Escherichia phage sequences in this database. And then finally we will need to write out the sequences in a suitable format for a sequence diversity analysis. Thankfully, restez can perform all these steps. Depending on how many GenBank files you select to download, the above process can take up to several hours. In this example, however, we will only download and set up a database for ‘phage’ sequences which should take between 5-10 mintues depending on your machine and internet connection. To download sequences, run the interactive function db_download(). Which sequence file types would you like to download? Provide one or more numbers separated by spaces. Which files would you like to download? We can download all phage sequences by typing 19. After pressing Enter, we will be told of the likely total file size of the download. If you have enough free space, push any key to continue. This will then initiate a download process for all phage sequences files on GenBank. After the download process has completed, we can create the database with db_create(). This will add all of the downloaded files to the database. It will take a while to complete. When it finishes, we can then identify our Escherichia phage sequences! After we have built the database, we can query it! For every new R session, we will always need to point restez to the database using restez_path_set() and then connect to the database with restez_connect(). To get started, let’s see the database status, is it ready for querying? restez comes with a series of gb_*_get() functions for parsing the GenBank records to pull out specific elements (sequences, definition lines, whole records). We can find records in the database using Accession IDs. To list all Accession IDs in a database, we can use list_db_ids(). #>  "Unidentified clone B15 DNA sequence from ocean beach sand"
In our scenario, we’re interested in finding and writing out all the Escherichia phage sequences. We can do this by looking up the organism names of the sequence sources of all the sequences in the database. We can then parse these names for "escherichia" and write out the resulting list of sequences. To minimise the coding effort on the part of a user, restez has been built to work with R packages that already connect to NCBI’s Entrez. After setting up a restez database the same functions of these other packages can be used to query NCBI Entrez. Internally, restez will query its local database and if it cannot find all of the requested sequences it will pass these arguments on to these other packages. For example, users can use the entrez_fetch() function of the rentrez package. Running this function through restez means a user can first check the local database rather than make lots of queries over the internet. The function arguments are exactly the same. Additionally, users can set up up a restez database before launching a phylotaR run. phylotaR searches NCBI for orthologous sequence clusters for a given taxonomic ID. If a restez database is set-up, phylotaR will first search the local database before downloading via Entrez. Protein database - the current code could be easily duplicated for working with protein databases, not just GenBank. Taxonomy - integration of existing taxonomic packages with restez. Retmodes - restez only supports text-based return modes, it could be expanded to include XML. Please see the contributing page for more details and any updates. If you have any ideas of your own for new features than please open a new issue. Big thanks to Evan Eskew and Naupaka Zimmerman for reviewing the package; and to Carl Boettiger and Noam Ross for useful comments during the review; and, of course, to Scott Chamberlain for editing!